More land line people starting to do their taxes? That can’t be right. He just had a rally last night - that alone should have raised his approval to 60%. 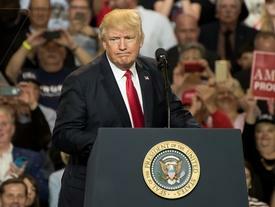 @Cratic3947 Trump’s approval dropped 2 points between yesterday and today. Just wanted you to know. It’s actually quite Impressive that his numbers are so high. 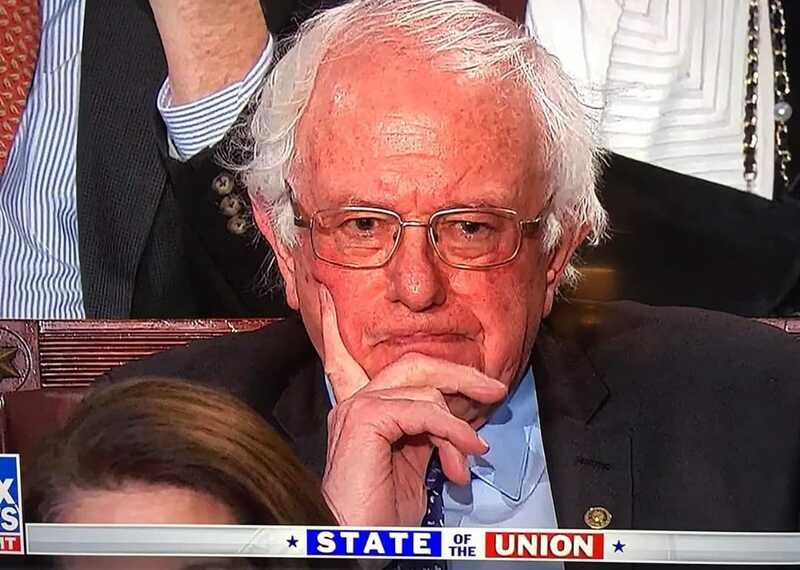 Sen. Bernie Sanders did not appear to enjoy President Donald Trump's condemnation of socialism in his State of the Union speech on Tuesday. It only plummeted 2 points in less than 24 hours because most of the people who would have answered the phone were at his exciting rally. Tomorrow they will POP back up to the low 70s probably. So if you said 57 states but meant 47, that’s basically the same? Heck yeah. Carry the 1, divide by zebra, and then multiply by astronaut. Perfect Trump math! Whats really funny about your own propaganda link is that they use the undoctored photo right below the color manipulated one. Guess it really is election season if we’re already doing the photo manipulation thing. Oh, I feel bad now… not!.. Why would you feel bad? Well now it’s 50% approve to 49% disapprove. According to Rasmussen. So that’s a drop of four points in two days. Disapproval actually went up a point today. 48% disapproved yesterday, 49% disapproved today. Still 50% approval today, down from 52% when this thread was posted. It most certainly won’t “go back up.” What you saw was a post-SotU bump. And when it goes down, will you still believe Rasmussen’s numbers, or will you do what you did during the election and dismiss Rasmussen as unreliable fake news? I’m curious what folks think is the upper bound of support for this guy on a Rasmussen poll. I’m still not tired of winning though Mr. President. How high did Obama get after his State Of The Union Address? I don’t mean high like off pot, I mean Approval ratings. We can both agree on that one. So I wouldn’t be wrong on that one, and we’d both be right. And so the friendliest Trump poll has him negative again. 49% approve to 50% disapprove. So that’s a six point drop from eight days ago. Doesn’t matter though. Trump will still claim he has 52% approval from one poll even though that one doesn’t even say that anymore.